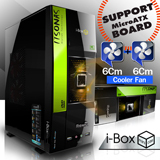 • Model: ITSONAS i-box mini CASE • Power Supply 500W 8cm fan with USBx2 supports all periods. Power Supply500 Watts.8cm mini power rear fan 2 Fans 6 cm. Length of 375 mm., Width 135 mm. Elevation 355 mm. IDE Port2 Ports SATA Port2 Ports Slot HDD3 Slots Slot CD / DVD ROM1 Slots USB 2.02 PortsMaterialMaterial SECC Warranty1Y.